In life, it seems like there’s only one thing EVERYONE can agree on – and that’s the fact that french fries are the most delicious food ever. Fries > everything, right? But, when we’re trying to perfect our complexion and kick acne to the curb for good, could eating french fries mess with our skin and cause breakouts? As french fries’ #1 fans, we needed to know whether or not fries were good or bad for our skin. Here’s what the studies — and dermatologists — say. 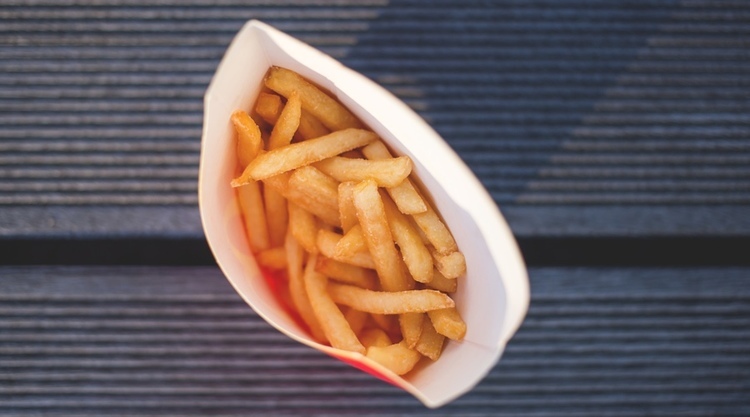 According to dermatologists, there’s no direct proof that eating “greasy” foods like french fries causes acne. BUT, there IS proof that both salt and hyperglycemic foods (Carbs) may increase the number of acne breakouts. French fries definitely fall into this category. Bummer. Besides that, when you eat fries (Or any greasy food, for that matter), there’s a chance you may leave oil debris around your mouth without even realizing it. If that oil’s not washed away from your skin, it can clog your pores and cause breakouts all around your mouth. Breakouts around the mouth are SO not fun and we all wanna avoid that at all costs! According to our MDacne dermatologist, if you’re fighting acne breakouts, french fries aren’t the best food to eat all the time — we should avoid eating fries, if we can, when we’re trying to get perfect, clear skin. What should you eat if you wanna clear up your skin? Try eating more fish (Specifically, fish that are high in Omega-3s, which are fatty fish), getting your daily fill of veggies, eating probiotics (A great natural source for probiotics is yogurt) and filling up on foods that are high in zinc. If you’re thirsty, drink green tea (It’s filled with good-for-you antioxidants) and water. So much water — your skin loves water, so drink it all day long!